I’m not talking about being able to play complex rhythms, just being able to play reliably keeping really good time. Even if you only know a handful of chords but you can play really consistent, tight, in time, eighth note rhythms you will soon a reputation as a good player. You will impress far more people than someone who knows a hat-full of chords and licks but can’t play them in time. Additionally, a metronome is vital for improving your ability. As soon as you can reliably get your fingers around something new at a slow speed then you should start practicing it with a metronome and build up the speed that way. It is amazing how much we let ourselves get away with when we don’t have an external timekeeping device. Yes, it’s important to have great internal rhythm, but you get that from practicing to a click and internalising that, not by disregarding metronomes altogether. When learning a new piece, phrase or lick I suggest that students start without a metronome while they first figure it out and get their fingers in the right places. 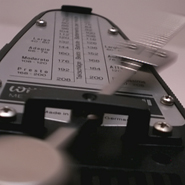 Then start using the metronome to bring the piece or phrase up to speed. This might take several days or weeks. Once this is done, stop using the metronome to allow some expression and fluidity back into the music – this is especially important for classical and unaccompanied pieces. These days anyone with a smartphone can download a metronome app easily and cheaply (probably for free). 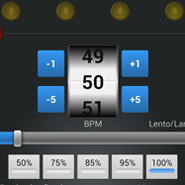 My favourites for Android are Metronome Beats (which I reviewed here), Drummer’s Metronome – both free – and Tempo by Frozen Ape (around £0.79). Tempo is the one I use on a daily basis for my practice. I don’t have an iPhone, so I don’t know as many options for that, but Tempo is available for iOS and you wouldn’t go wrong with that. If you have something that can play repeated drum loops or beats, especially if you can easily change the tempo, that will work just as well. It has the additional benefit that you have a beat you can ‘groove’ to rather than just the sterile click of the metronome. However, it’s not essential, an ordinary metronome is totally fine on its own.